Performs a Point in Polygon overlay. 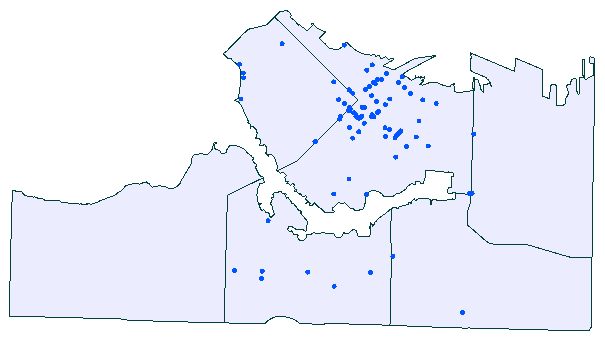 Points receive containing area attributes, and areas receive contained point attributes (spatial join). The PointOnAreaOverlayer compares points and polygons. Each point receives the attributes of the area(s) it is contained in, and each containing area receives the attributes of each point it contains. Intersections between area features are not computed. FME consider points on the boundary of an area as “in”, and so if a point falls exactly on the line between two polygons, it will be considered "in" both areas. Aggregates can either be deaggregated before processing or rejected. In this example, we have a point dataset of food vendors and a set of polygons representing neighborhoods. To find which neighborhood a vendor is in, we connect the food vendor points to the Point input port, and the neighborhoods to the Area input port. In the parameters dialog, the default settings will provide the correct results. Note that the Attribute > Accumulation Mode is set to Incoming, which will add attributes from the containing neighborhood polygon to each point. 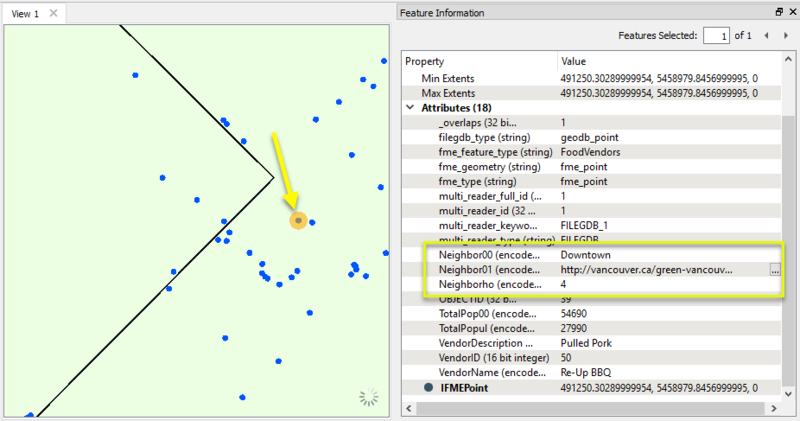 Looking at the food vendor points output, we can see that the containing neighborhood attributes have been added. 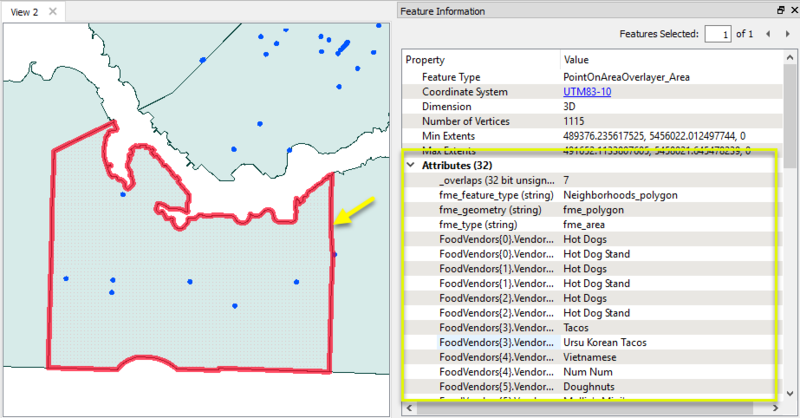 Looking at the area output, the _overlaps attribute tells us how many food vendors exist in each neighborhood. Using the same food vendor points and neighborhood polygons as the previous example, we can also build a list attribute that contains all of the food vendors for a given neighborhood. In the parameters dialog, enable Generate List on Output ‘Area’, give the list a name, and select the attributes to be included. Inspecting the output, we can see that the Fairview neighborhood contains 7 food vendors, and the names and descriptions of those vendors are contained in a list attribute. If you have a lot of features to process, you can improve overlay performance by also using the Clipper transformer. The Clipper also provides different options for a point that falls exactly on a line. See the Clipper example from the FME Community for information on how to use less memory using the Clippers First parameter. If you have a lot of Point features in particular, you can reduce memory usage of the PointOnAreaOverlayer by using the Areas First parameter. Note that where Point geometries are expected as input, PointCloud geometries are not supported. The PointOnAreaOverlayer does not have a tolerance option for position. Point (including text) features against which areas will be compared. Area features against which points will be compared. Point features, with attributes added according to transformer parameter configuration. Geometry is unmodified. Area features, with attributes added according to transformer parameter configuration. Geometry is unmodified. Features with invalid geometries will be rejected and output via this port. Overlap Count Attribute The Overlap Count Attribute added to output point features holds the number of area features that they were inside of. 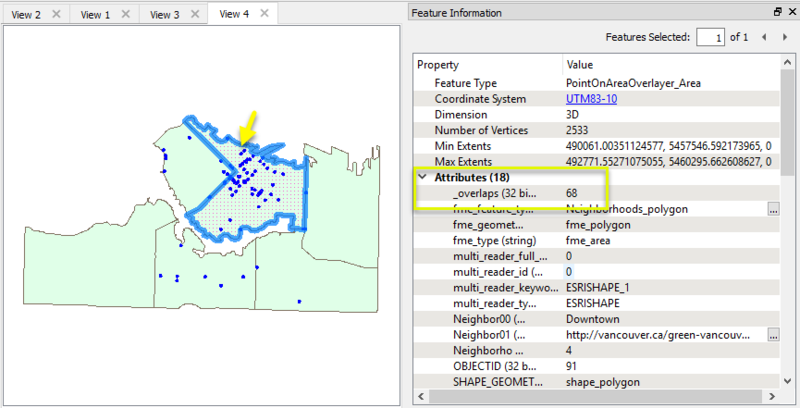 The Overlap Count Attribute added to output area features holds the number of point features that they contained. If Areas First is set to Yes, then the PointOnAreaOverlayer assumes that all Area features will enter the transformer before any Point features. This can reduce memory use of the PointOnAreaOverlayer if you have many Point features to overlay. Any further Area features that arrive after the first Point feature will be logged with a warning and discarded. If the Input Ordered parameter is set to By Group, the Area First requirement applies to each group separately. This means that the Area and Point features from the first group must enter the transformer before the Area and Point features from the second group. Choose how aggregate geometries are to be handled. Deaggregate: Decompose aggregates into their individual components. Reject: Do not process aggregates and output them via the <Rejected> port. If attributes on the incoming and original feature share the same name, but are not geometry attributes that start with fme_, then they are deemed conflicted. Merge Incoming: The original feature will retain all of its own un-conflicted attributes, and will additionally acquire any un-conflicted attributes that the incoming feature has. 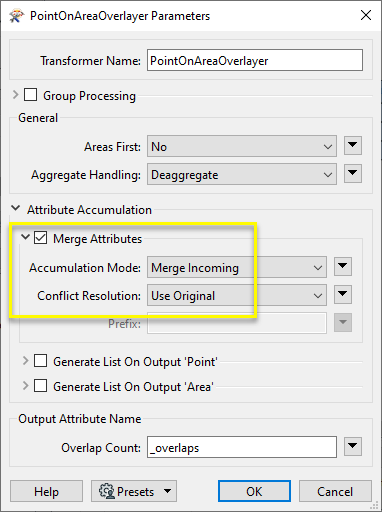 This mode will handle conflicted attributes based on the Conflict Resolution parameter. Prefix Incoming: The original feature will retain all of its own attributes. In addition, the original will acquire attributes reflecting the incoming feature’s attributes, with the name prefixed with the Prefix parameter. Only Use Incoming: The original feature will have all of its attributes removed, except geometry attributes that start with fme_. Then, all of the attributes from one (arbitrary) incoming feature will be placed onto the original. Use Original: If a conflict occurs, the original values will be maintained. Use Incoming: If a conflict occurs, the values of the incoming will be transferred onto the original. Prefix If the Accumulation Mode parameter is set to Prefix Incoming, this value will prefix attributes that are being added to the original feature from the incoming feature. When enabled, adds a list attribute to the Point output features, and the attributes of each area containing an output point are added to that point's list. Note that no intersections between area features are computed. All Attributes: All attributes will be added to the output Point features. Selected Attributes Enabled when Add To 'Point' List is set to Selected Attributes. Specify the attributes you wish to be included. When enabled, adds a list attribute to the Area output features, and the attributes of each point contained by an output area are added to that area's list. All Attributes: All attributes will be added to the output Area features. 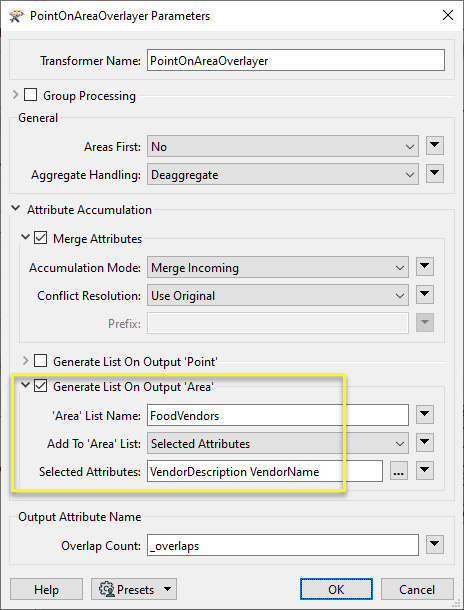 Selected Attributes Enabled when Add To 'Area' List is set to Selected Attributes. Specify the attributes you wish to be included. Search for all results about the PointOnAreaOverlayer on the FME Community.